Do you want to tone up or lose weight? Have more energy or just feel better about yourself? Kate Conwell, owner of Pure Body Fitness, two-time Olympic Trials competitor, and nationally certified personal trainer, can help you shift into a higher, more active gear. Whether you’ve tried to get in shape but haven’t succeeded, aren’t sure how to begin, or want to power up your current workouts, Kate is passionate about teaching you how to achieve your goals. Partner with her, and you’ll begin to live a healthier lifestyle, gain more self-confidence, and see the results you want. Kate’s reputation for excellence is well known – both inside the gym and out. Always striving to better serve her clients, she creates customized workouts to address specific areas of need and focuses on safe, effective exercises. Her technical elite athlete background and technical knowledge of fitness, teamed with heartfelt encouragement, is a powerful combination that really works. Choosing Kate over other personal trainers makes good sense. The same successful, determined drive for excellence she shows as a trainer also helped her become an elite level athlete and two-time Olympic Trials competitor. Kate got her first taste of sports as a tiny gymnast at age 3, and continued to be active in athletics throughout her early school years. She went on to be Oregon’s state high school pole vault champion, and then a five-time NCAA Division I All-American. In 2005 Kate won a coveted Collegiate National Pole Vault Title for the University of Washington, where she received a B.A. in Business Marketing. After college, Kate continued training and began competing on the professional track circuit. Supporting herself and her Olympic dream required a flexible job that allowed her to train and compete. After a yearlong internship with Athletes in Action (a non-profit Christian organization), she decided to invest in her passion for fitness through personal training. She earned a National Academy of Sports Medicine (NASM) Personal Trainer's Certification and, in 2006, she launched Pure Body Fitness. Kate understands you may have questions – especially if you’ve never teamed up with a trainer before. That’s why she always offers a complimentary Q & A session. Call today! See Kate's profile on Thumbtack by following this link - Personal Fitness Coach. Learn more about Kate’s pole vault career by watching the video documentary created by the Seattle Times just before the 2008 Olympic Trials. Check out her life time best jump of 14'4" below. As an elite athlete, Will Conwell has been one of the nation’s top-ranked men's discus throwers for the past six years, and has competed in two Olympic Trials. But as your personal trainer, Will combines his love of athletics with professional certifications and a passion for helping you reach your own fitness goals. 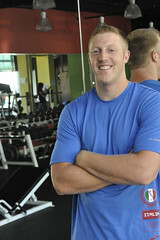 Throw in a sense of humor that makes every workout fun, and Will is a top choice in personal trainers. Like Kate, his wife and founder of Pure Body Fitness, Will’s passion for fitness was fueled early on. Encouraged by his aunt and uncle, he began throwing the shot put in 7th grade. He went on to set records throughout high school and win the Washington state shot put title in 2000. Will attended the University of Washington and graduated with a B.A. in Geography in 2006. While there, he dedicated two years to the Husky football team, yet his passion for throwing was too strong to set aside. Focusing on the discus, Will competed at the Division 1 National Championships and the U.S. National Championships in 2006. His successes spurred him on to participate in the 2008 Olympic trials, where he finished sixth.